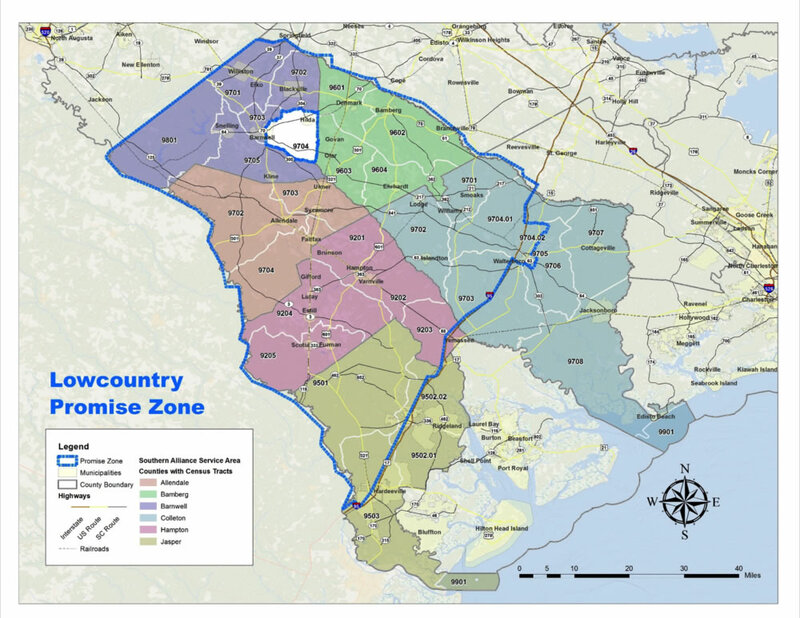 The South Carolina Lowcountry Promise Zone designation provides a new way for people in Allendale, Bamberg, Barnwell, Colleton, Hampton and Jasper counties to benefit from grant programs administered by certain federal agencies. What the designation is not: Promise Zone designation does not provide grant funding for projects. Having the “designation” is, however, a special pathway for counties in the Zone to tap into grant funding. What the designation offers: The Promise Zone designation provides priority consideration for grants submitted to certain federal agencies by organizations within the Promise Zone or organizations planning work that will benefit citizens who live in the Promise Zone. 1. Develop project plans and secure project partners. 2. Research federal agencies to determine which offer grants that could fund the project and offer priority consideration to Promise Zones. 3. Complete the appropriate federal agency’s grant application using internal staff, partner staff or external grant-writing sources. You may want to consider partnering with an organization that has staff in place with grant-writing experience. Most counties and large municipalities have grant writers on staff. Contact the Council of Governments in your area to inquire about their grant writing services. * The Lower Savannah Council of Governments serves Allendale, Bamberg and Barnwell counties. * The Lowcountry Council of Governments serves Colleton, Hampton and Jasper counties. Hire an experienced grant writer. 4. Once your grant application is underway, contact the Promise Zone for an endorsement form for the grant project (see checklist below). 1. A completed Grant Endorsement Request Information spreadsheet. 2. A copy of your grant Executive Summary. Please submit the items 1 and 2 in one email to the Promise Zone Coordinator at info@scpromisezone.org. 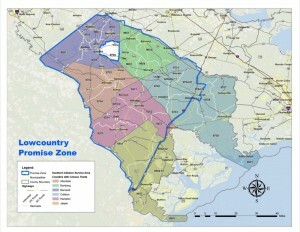 The South Carolina Lowcountry Promise Zone Coordinator will review your information as quickly as possible. If it is determined that your grant will provide benefit to the S.C. Lowcountry Promise Zone, we will forward a signed endorsement form to you. To receive Promise Zone Priority Points and preferential placement from the granting agency, you will need to include the signed endorsement form in your grant submittal package. REMINDER: Do not wait until the last minute to request your signed endorsement form please.